Why does America find it so hard to save? 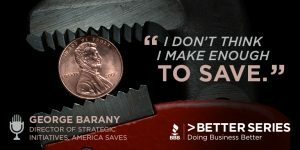 George Barany, Director of Strategic Initiatives at America Saves helps to answer this question as well as provide information on how employers can make saving easier. April is Financial Literacy Month, so tune into this episode to learn how the Split To Save Program can support employees in their savings effort.